Historically, where fashion has forged ahead, accessories are never far behind. Jewelry demonstrates this fact elegantly with every trend to hit the runways, and nowhere is it more apparent than in this year's fashions. Bold is beautiful again, and splashes of dark jeweltones against contrasting colors are making an appearance on catwalks worldwide. Deep, true colors are beginning to eclipse the popularity of pastels in the last few seasons, with delicate purple tanzanites and aquamarines giving way to the lush tones of ruby reds and emerald greens. Striking against all skin tones, bigger is better when it comes to these gems, with large pendants and striking earrings stepping out of their supporting role to dazzle in the spotlight. Unsurprisingly, exotic variations of popular gems are leading this particular trend, with unique offerings like black diamonds and yellow sapphires finding favor with celebrities and trendsetters known for their superior style. Chocolate diamonds, which feature a brown hue, are also finding favor - sometimes fetching prices that rival those of their colorless counterparts as celebrities clamor for something new and different. Settings are taking a simple tack once more, and the days of funky, chunky pieces like turquoise nuggets and amber hunks are swiftly coming to an end. Smooth cabochons of a deep amethyst ring and garnet reds evoke a wink and a nod to the gemstone "meanings" of the new age revolution. Engagement rings, in particular, are shifting from clear diamonds to more colorful hues, thanks in no small part to the famous heirloom sapphire engagement ring that recently kicked off royal wedding fever over in England. 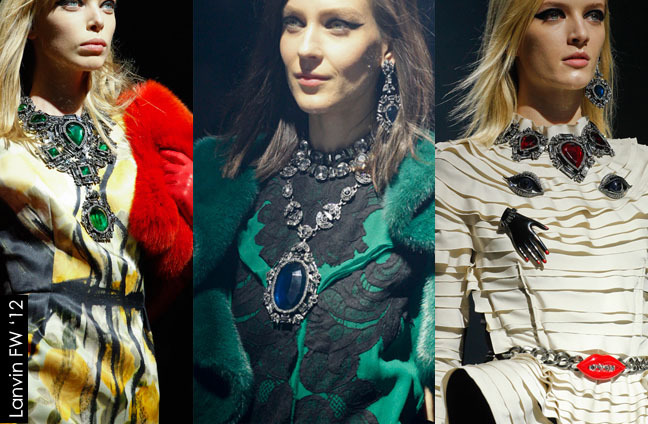 On fashion covers nationwide, large pendant necklaces of traditional dark jewels are showing up around the necks of models at the Lanvin Fall '12 runway, actresses and singers alike. Drawn to the dark colors of ruby, emerald and sapphire for their contrast against bare decollage, these fashionistas know how to wear their gemmed necklaces alone or grouped with chains for a chic bohemian look that coaxes the paparazzi to take a shot. Burgundy reds, azure blues and mossy greens are the palette that this season's hottest fashions are painted from, and with one glance at the gems that inspired them, it's no surprise.